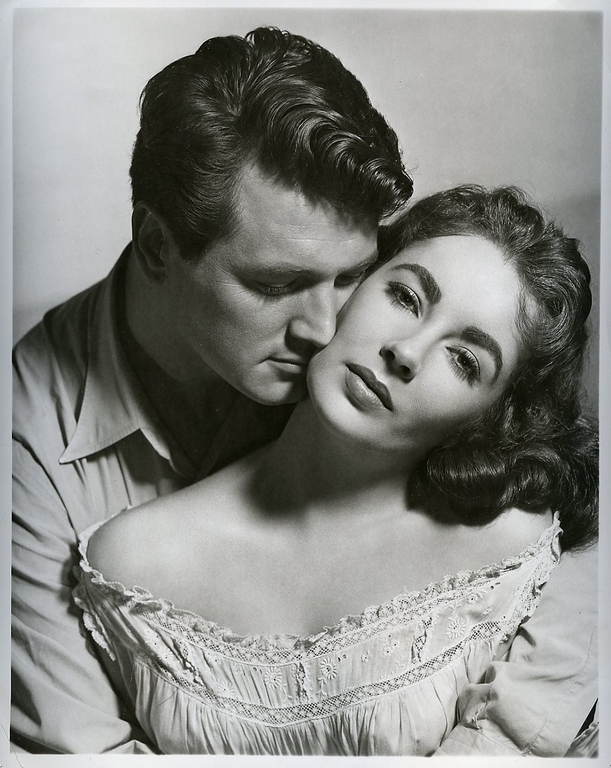 Sometimes I see a photo and think to myself – what would they look like as skeletons? 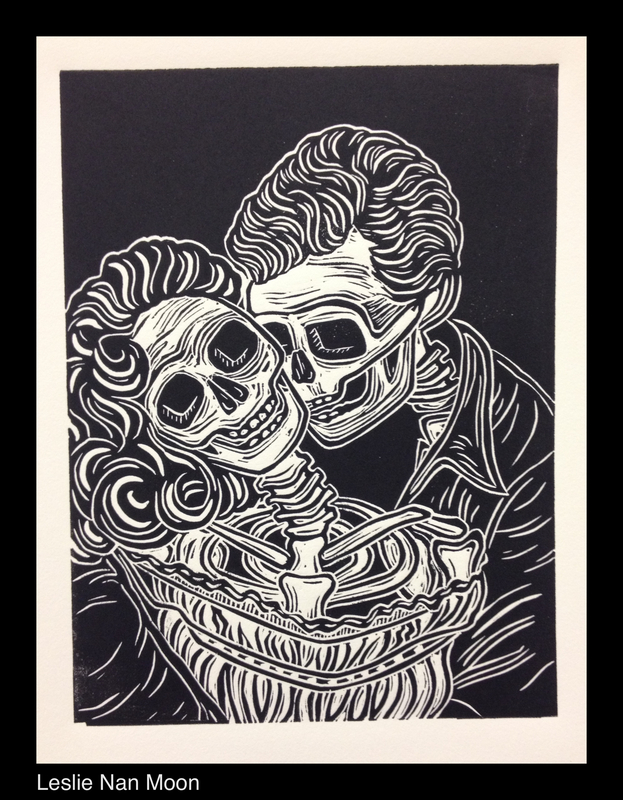 Here’s one of my most recent Dia de los muertos linocuts inspired by the classic photograph of Elizabeth Taylor and Rock Hudson. While I was at the Sammamish Arts Fair last weekend I decided to carve a linocut at my booth to give visitors a chance to see my work in process. I really enjoyed live demo-ing my work and even set up a station for visitors to try their hand at block prints. I brought in “ez cut” blocks which are really soft (just like big Staedtler rubber erasers) rather than have them carve into traditional linoleum like I use. It’s getting closer to the holiday season which means it’s almost time for the release of the latest MRS. MOON’S MISFIT TOYS!!!! I’ve just finishing carving two new ones and have two more drawn up. Stay tuned… they are great! Great day at the Sammamish Arts Fair! 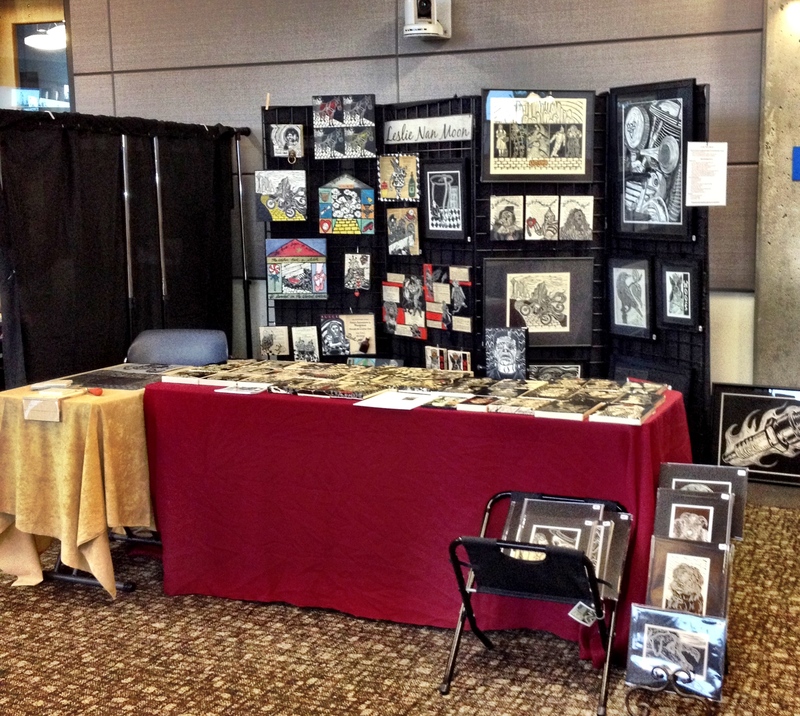 What a wonderful first day I had at the Sammamish Arts Fair! Spoke with so many lovely people. 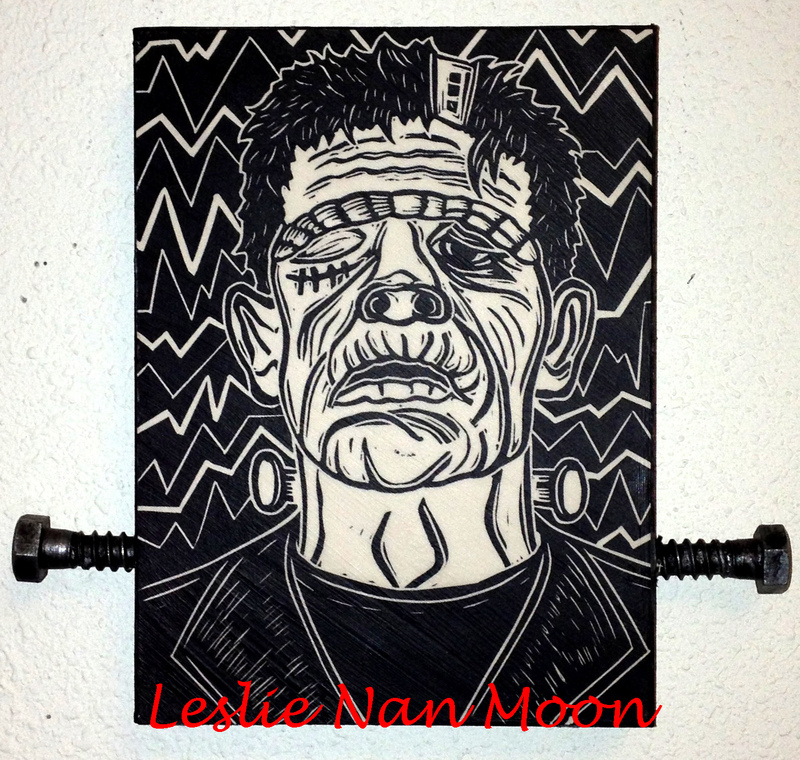 I really enjoyed bringing one of my linocuts in process to demonstrate my art. Spent some time tonight finishing a few more new pieces to bring tomorrow. Looking forward to another great day ! I’ve always LOVED to make art. Printmaking has been my passion since I first discovered it when I took it as an elective my first year of undergraduate school (my intended major was sculpture). I was hooked. 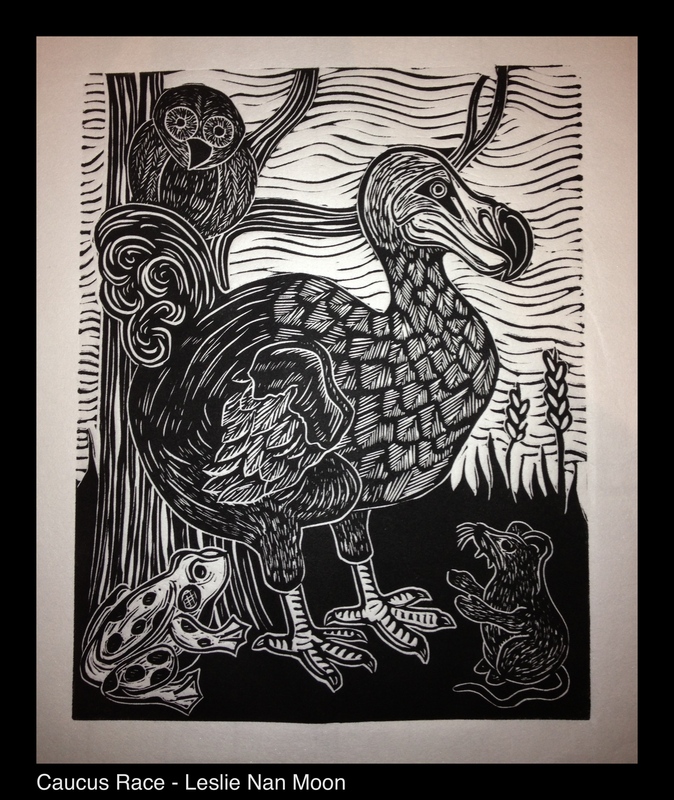 After graduating U of the Arts I decided to apply for a graduate program in Printmaking at the University of Washington. The year I applied only a handful were accepted and I was not one. It was my intention to still move to Seattle and reapply. I never did. Instead I just started living my new life out here in this wonderful place. I continued to make art, had some shows in Pioneer Square and worked at Daniel Smith (manufacturer of the printmaking inks I used all through college). Jump forward many years… now I’m married to a wonderful man who I met while I tried my hand at racing motorcycles. Didn’t fare well racing but it did bring us together. We have 11 year old twins. My daughter Elly is typically developing and as most 11 year old girls do she drives me crazy (but that’s normal I think!). She races motocross which makes my husband very happy as motorcycles are his passion. She’s a special kid and I cry when I think of all that she has to bear witness to and miss out on due to the cards we were dealt. Our son Trevor is loving, funny, sweet (a good amount of the time), intelligent and PROFOUNDLY autistic. Living with someone on the autism spectrum is exhausting. Trevor can be very aggressive when autism digs it’s claws into him. At 120 lbs and the same height as me this can be scary, challenging and draining. I always have to be ON, paying attention to everything. He doesn’t like change so I can’t just hang up a new piece of artwork in the house without working with him on accepting it (otherwise he will just rip it off the wall and throw it). He imitates shows he likes (I’ve been bitten HARD when he acts out cookie monster and karate chopped when he acts out Miss Piggy). He’s made great progress since we started doing constant therapies when he was 15 months old but can never be left alone and can’t have just anyone watch him. This is where my art comes in. When I’m working on a new linocut or woodcut I get lost in it. It takes me away from being a mom of an autistic child. It makes me forget for a little while about my daily life and my uncertain future. I need it. It gets me up some mornings and helps me sleep better some nights. The bonus is people enjoy it! I’m proud and honored everytime someone purchases a piece of my art! 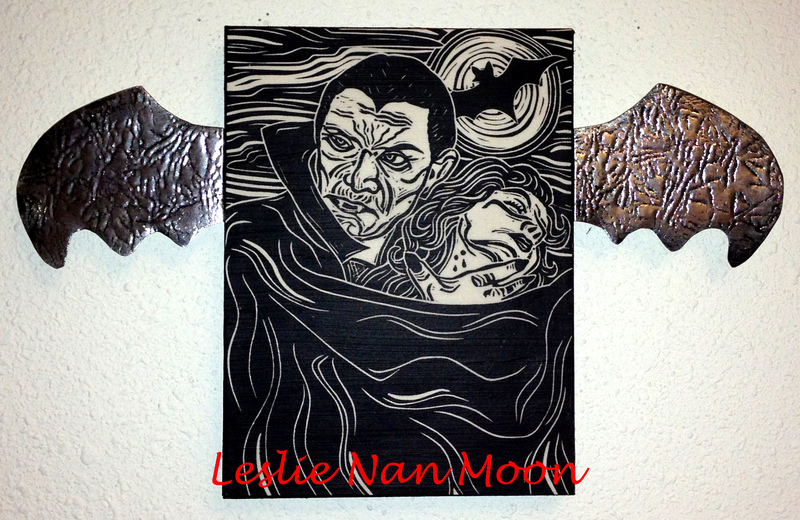 Had to have some fun with my Monsters – bolts for Frankenstein’s monster… making bat wings for Dracula out of metal! 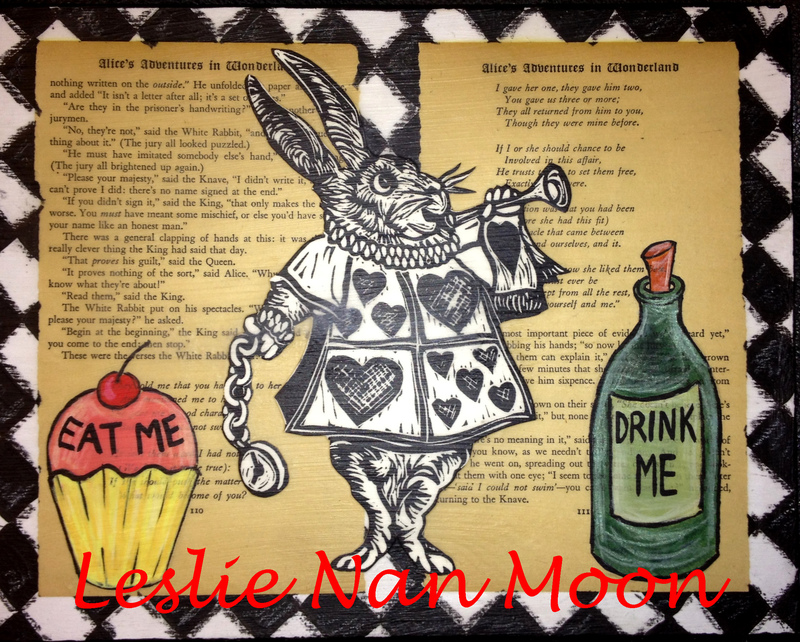 I also wanted to paint a little so I did some mixed media pieces with my prints, pages from old books and then hand painted elements. 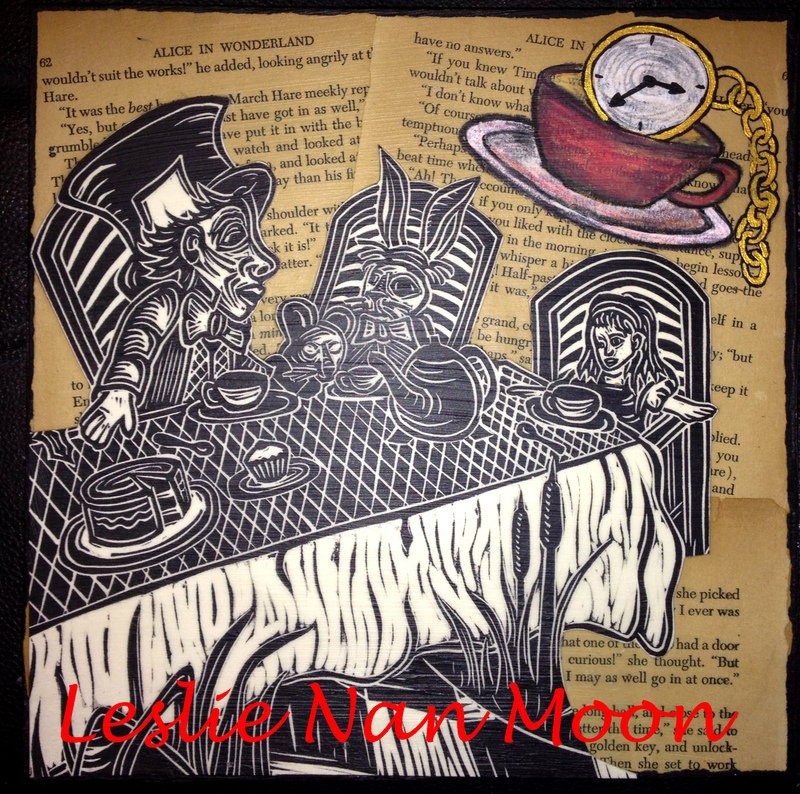 You are currently browsing the Lesliemoon's Blog blog archives for October, 2012.